Jamestown (JRMC) — A child who dies in the womb knows only its parents love. He knows no pain. Those were the words of the Rev. Jeffrey Wald, St. James Basilica, at Jamestown Regional Medical Center’s GOLF “fore” ANGELS event on Aug. 4. “We will always be a parent to that child – whether in our arms or in our hearts as angels in heaven,” he said. 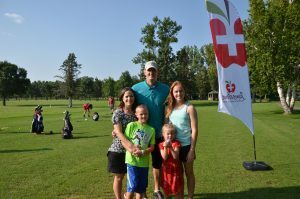 The 9-hole ANGELS tournament benefits infant bereavement care at JRMC. Every year, families experience the loss of an infant due to an unexpected circumstance. The Dr. Mandy and Dave Sorlie ANGELS fund helps pay medical bills for those parents through the JRMC Foundation. The fund is available to anyone who experiences infant loss at JRMC at the gestation of 16 weeks or greater up to 4 months of age due to unavoidable circumstances. ANGELS stands for Advocating for Neonatal Grief and Early Loss Support (ANGELS). ANGELS grant amounts and recipients are determined by the availability of funds. The grant covers the labor and delivery charges after insurance payments. On average, families that have insurance would otherwise have to pay more than $1,500 for these medical services. ANGELS removes this financial burden and helps families grieve. Since it started three years ago, ANGELS has helped 10 families. In 2017, the tournament raised about $9,000. This year, the tournament raised $12,700 thanks to the support of more than 20 teams – the biggest in the ANGELS event history. 50/50 Cash Raffle: Mary Meyer. She donated it back to the fund. Zen Sleep Consulting Annie Schlecht, in honor of my sleeping angel, Kyan. Auntie loves you.